Have you felt the extra humidity in the air this week? This is just a small taste of what we have to look forward to this summer in the Ohio Valley area! Humidity outside is bad enough, but if you are noticing humidity inside your home, you may have a bigger issue. Excessive moisture in the air can be detrimental to not only your health, but also to your home! Condensation - Water forming on the inside of your windows could result in rotting, which is permanently damaging to those windows. Mold - Black, brown, or green mold can form when humidity levels are high. If you notice mold spores or rings of mold growing on walls and ceilings, your home and health could be at risk. Odor - Sometimes odor is created when moisture is rising in the air. As moisture seeps into the home and humidity increases, mild to severely foul odors can arise. Be sure to take notice if you have a change in the smell of the air in your home. Water Staining - Water stains on the floors, walls and ceilings are more damaging effects of high humidity. Brown stains or wet spots that do not appear to be drying are red flags that excessive moisture is in the air. 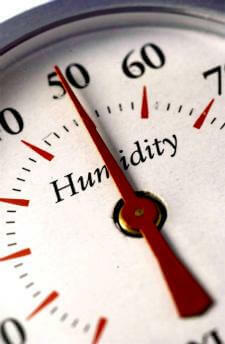 If you are suffering from excessive humidity in your home, your cooling system could be to blame. Consider the age and efficiency of your air conditioner, and call Logan Services for a free estimate on a new system.